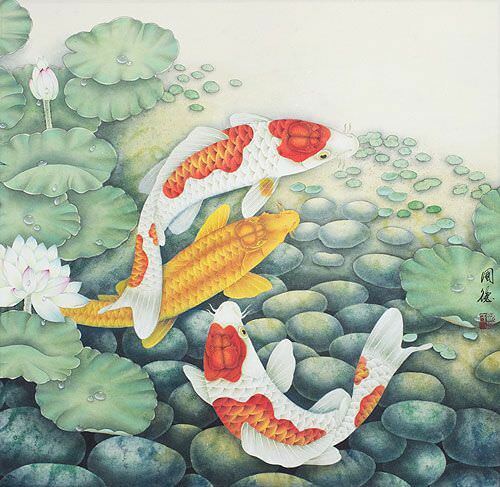 Buy Fish Chinese Calligraphy Wall Scrolls! We have many options to create artwork with the Chinese characters / Asian symbols / Japanese Kanji for Fish on a wall scroll or portrait. If you want to create a cool Fish Asian character tattoo, you can purchase that on our Chinese and Japanese Tattoo Image Service page and we'll help you select from many forms of ancient Asian symbols that express the idea of Fish. 5. Without a big net, how can you catch fish? 魚 is the character that means fish in Chinese, Japanese Kanji, and old Korean Hanja. 鯉 is the Japanese Kanji which created the title "koi fish." 鯉 is pronounced "koi" in Japanese. Here is the reality: 鯉 actually means "carp" in Chinese, Japanese Kanji, and old Korean Hanja. 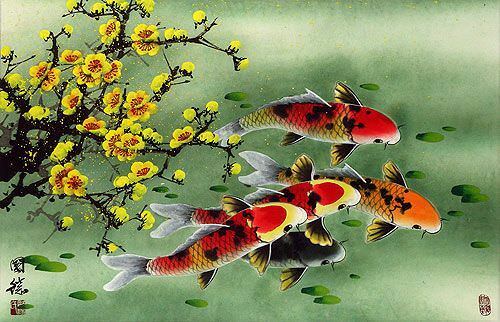 Koi fish really are carp (by species) and were breed to obtain colorful variations in ancient China. Some generations later, some of these colorful fish were transported to Japan, where they also became vastly popular. 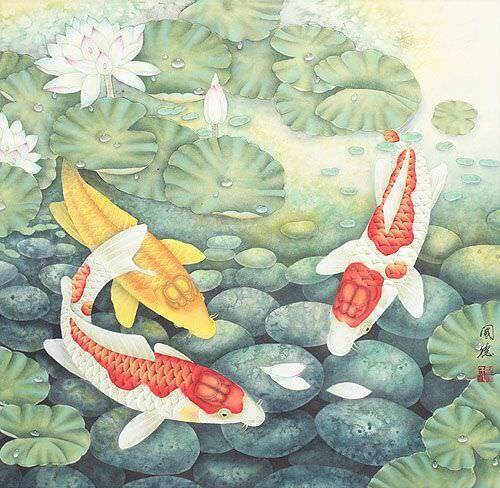 Note: Please see our other entry for koi fish (Nishiki Goi) which is a more normal selection for a Japanese koi fish enthusiast to have on their wall. 鯉魚 is one Chinese title for what westerners call "koi fish." This literally means "carp fish" (which is what koi fish really are). You probably want the other title, which is more specific to the colorful fish that you are thinking of. Look for "Nishiki Goi" on our website. 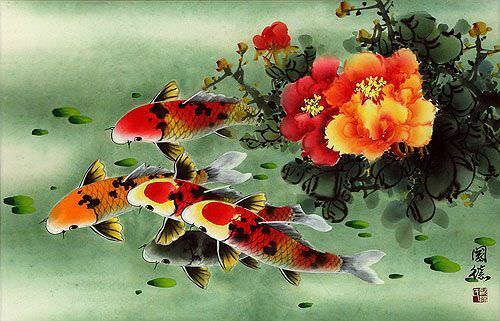 If you like or collect and maintain koi fish, this is the wall scroll for you. Technically, this is a certain and revered species of "koi fish" in Japan but it is the most normal selection for a wall scroll (more normal than the actual Kanji for "koi" or "fish" alone. This literally means "brocade carp" or "embroidered carp." 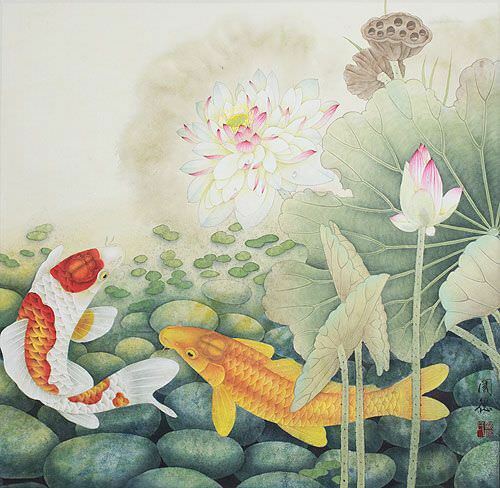 This term is also used to mean the same thing in China (which is the origin of koi fish breeding and cultivation, several generations before they became popular in Japan). For those of you that don't know, the Kanji for "koi" (which is pronounced "goi" in this entry) really means "carp." If you want the word that means "koi fish," it would just be the generic word for "carp fish." That would include both colorful carp, and the more mundane gray carp (the ones people eat, if they don't mind lots of bones). Without a big net, how can you catch fish? This Chinese proverb literally translates as: [if one does] not cast a big net, [one can] not get big fish. Figuratively, this means: One cannot make great accomplishments without making great efforts or taking great pains. This is sort of the fishing version of, "No pain, no gain." This is the Chinese version of the proverb, "Give a man a fish and you feed him for a day; teach a man to fish and you feed him for a lifetime." This implies that knowledge is the best charity. 扳機魚 is the Chinese title for the Trigger Fish. 年年有餘 is a common proverb or wish of prosperity you'll hear around the time of Chinese New Years. Directly translated character by character it means, "Year Year Have Surplus." A more natural English translation including the deeper meaning would be "Every Year may you Have Abundance in your life." On a side note, this phrase often goes with a gift of something related to fish. 年年有餘 is because the last character "yu" which means surplus or abundance has exactly the same pronunciation in Mandarin as the word for "fish." 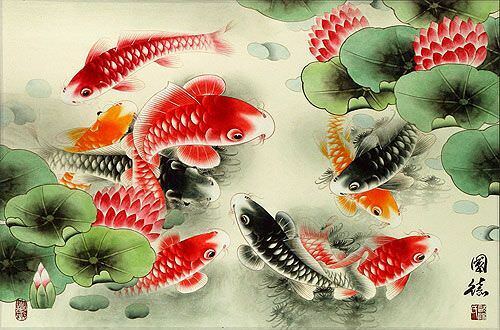 年年有餘 is also one of the most common titles for traditional paintings that feature koi fish. In China, this phrase might make an odd wall scroll - a customer asked especially for this common phrase which is why it appears here. See my other abundance-related words if you want a wall scroll that will seem more comfortable in Chinese culture. A 鲲 (Kun) is a famous sea monster, often associated or used interchangeably with a 鵬 (Peng). 鯤 is comparable to Leviathan or Jonah's whale. In Chinese mythology, the Kun is a giant fish said to be able to turn into a bird. 鯤 and the mythological creature is also known in Japanese and Korean. However, in some context, this character can refer to fry (fish babies). 美人魚 is the Chinese word for mermaid. It literally means "beautiful human fish." 人魚 is the Japanese Kanji, Korean Hanja and Chinese word for "merman" or "mermaid." It literally means "human fish." 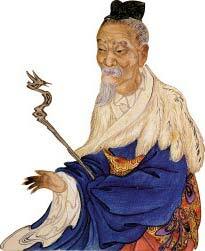 人魚 is a non-gender-specific or unisex word in all three languages. This single Chinese character means shark. However, in Japanese, it can refer to the family of goby fish. 鯊 is good if you're looking for shark in Chinese but Japanese may misunderstand it. 鯊魚 means shark (literally "shark fish") in Chinese. スズキ is the Japanese Katakana name for Suzuki (Japanese automobile and motorcycle manufacturer). This name can also refer to a fish (specifically a sea bass or perch). 鮪 is the Chinese and Japanese character for tuna. In Chinese, this is usually used to mean the "little tunny" (Euthynnus alletteratus), the most common tuna in the Atlantic Ocean. However, it can refer to any fish of the Thunnus genus. In Japanese, it can refer to the Pacific bluefin tuna (Thunnus orientalis). 雙魚座 is the Chinese way to write Pisces (fish) of western astrology. Please note this version is only used in Chinese (see other version if Japanese is your audience). 魚座 is the Japanese way to write Pisces (fish) of western astrology. Please note this version is only used in Japanese (see other version if Chinese is your audience). 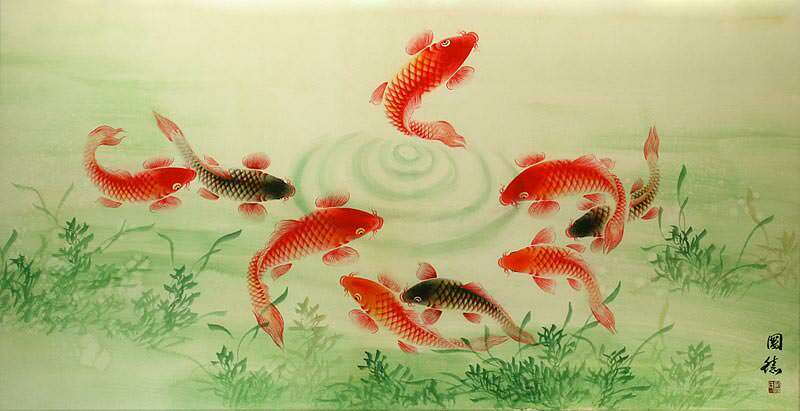 Original Chinese brush paintings of fish, buy original brush art online including the new eternity circle fish scroll or painting. Chinese food need never be a once-a-week-restaurant treat again! Delicious and easy-to-follow Chinese fish recipes. Chinese recipes for sweet and sour and steamed fish. Koi fish how to buy Japanese Koi and start a healthy pond. Find everything from Koi history to much more. Koi fish shipped overnight.